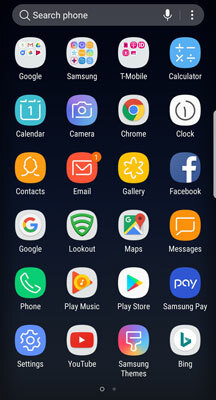 The Home screen is the first screen you see when the Galaxy S8 phone is done with setting up. Additional screens off to the right and left make up the extended Home screen. They can be seen as a panorama here. 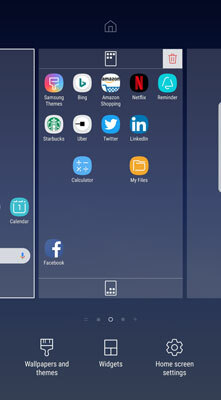 The Galaxy S8 phone panorama display of the extended Home screen. At any given moment, you see only one screen at a time. You navigate among the screen by flicking to the right and left. The Home button will always bring you back to the Home screen. 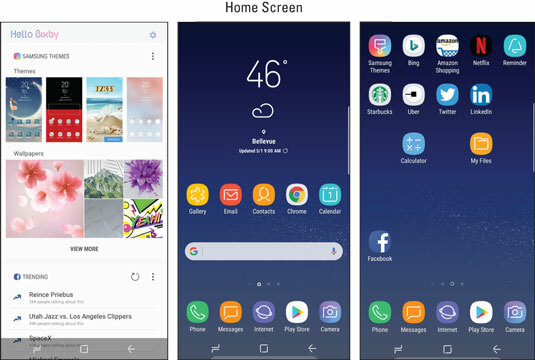 The extended Home screen is where you can organize icons and other functions to best make the phone convenient for you. Out of the box, Samsung and your cellular carrier have worked together to create a starting point for you. Beyond that, though, you have lots of ways you can customize your Home screens for easy access to the things that are most important to you. The notification area: This part of the screen presents you with small icons that let you know if something important is up, like battery life or a coupon from McDonald’s. The primary shortcuts: These five icons remain stationary as you move across the Home screen. If you notice in Figure 2-15, these have been determined by Samsung and your cellular carrier to be the five most important applications on your phone and are on all the screens. The Function keys: These three keys control essential phone functions, regardless of what else is going on at the moment with the phone. Important areas on the Galaxy S8 phone and Home screen. There are a series of dots just above the primary shortcuts on the extended Home screen. You may also notice that one of the dots isn’t just a dot — it’s a little house. That is the “home” Home screen. The brightest dot indicates where you are among the screens. You can navigate among screens by dragging the screen to the left or right. This moves you one screen at a time. You can also jump multiple screens by tapping on the dot that corresponds to the screen number you want to see or by dragging the dots to the screen you want to see. The following sections give you more detail on each area. One of the significant changes Samsung has implemented with the Galaxy S8 is the “invisible” Home button. 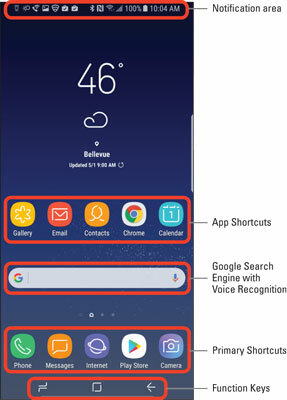 In past versions of the Galaxy S Phones and Notes, it has been a physical button on the bottom of the front screen. To offer more screen real estate, the S8 makes it a software-based button on the bottom in the center of the function keys. The Galaxy S8 Home button on the front. The Home button is very important because it brings you back to the Home screen from wherever you are in an application. If you’re working on applications and feel like you’re helplessly lost, don’t worry. Press the Home button, close your eyes, click your heels together three times, and think to yourself, “There’s no place like home,” and you will be brought back to the Home screen. From the extended Home screen page where there is some space for the icon of an app, swipe your finger upward on the screen. This brings up a directory of all the apps you currently have on the phone. The page shown here shows just one page. The number of apps and pages for their icons is practically unlimited. Press and hold the icon of the app you want to add. The screen with the app icons fades, and the extended home page with the space for the icon appears with the icon under your finger. Move the icon to where you want it to be on the Home screen page and release. Say that you put the shortcut on the wrong spot. No problem. Press and hold the icon. The screen grays out except for your icon. It looks something like this figure, except the icon you pressed is in full color under your finger. The extended Home screen in repositioning mode. You then drag the icon to the place on the screen you want it to reside and release. Taking a shortcut off your Home screen is simple: Press and hold the icon on the screen. In a moment, you see the grayed out home page. Drag the doomed shortcut to the garbage can, and off it goes to its maker.